Read more about Bangalore majestic bus station. The landmark of Bangalore , hub of all busses and commuters to travel from one destination to other is going to come stand still for next 3 years. KSRTC bus station or Majestic (well known as) is going to stop functioning from next week for next 3 years. All busses starting from KSRTC will redirected many other Stallite Terminal service in and around Bangalore. 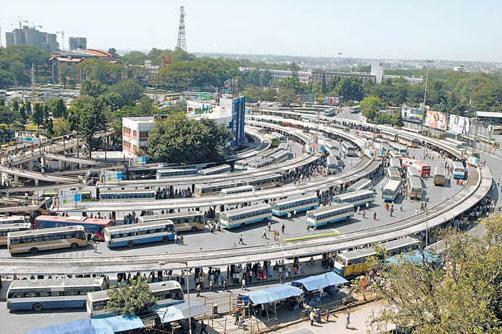 Majestic bus stands handles about 2700 buses everyday and lakhs of commuters.. All the inter-state and other state operation will be shifted to different location in Bangalore. This will mean that now the daily commuters will need to pay a high price for the relocation. Majestic bus stop is giving way to the Metro rail underground project which is accepted to complete by 2012. The Metro team requires about 20 acres of land to carry on their work, so this is the only reason there is make shift all the terminal bus station to stallite services, this was announced by the Transport Minister R Ashok. This will cause a major trouble for the commuter who are coming to railway station and like to travel to nearby place. They will need to go the Satellite bus service which may be sometime outskirt of the city. Transport minister has mentioned that it may be concern however, they are going to look into alternative. The Bus terminal such as Shanthinagar and Kengeri are not in situation to handle capacity or load as they have very limited operations. The same applies to the other stations also, it lack of infrastruture and facilities. What this will mean for a common man? More auto fares, long distance to travel for nearby destination, long hours of travel.